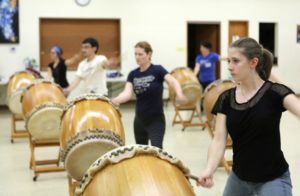 We’re thrilled to announce our next round of taiko classes beginning on Thursday, February 1 with our two-hour TAIKO 101 WORKSHOP and continuing with our new INTRODUCTION TO ODAIKO AND SHIME classes from Wednesday, February 7 to March 21. For our more experienced students, BEYOND BASICS will provide an opportunity to strengthen your skills, build on repertoire learned in previous classes, and concentrate on form, timing, and ensemble playing. We hope to get you drumming in the new year!